When we think about a dog barking, we don't always make the connection to a child's jabbering. We once thought that children should be seen and not heard. Few people abide by this line of reasoning nowadays, when it comes to children, but may feel differently about their dog’s barking. These owners seem to want their dogs to stop barking, period. According to them, a good dog is a quiet dog, and the only time that barking is permitted is when there’s a man in a black balaclava and stripy prison outfit, crawling in through your bedroom window. Anyone who ever visited my home knew that I owned dogs. No way can I keep my dogs a secret as their initial barking is a dead giveaway. Most of the time my dogs are quiet, however, but every once in a while, they bark and I often can’t find the cause. A little barking is fine but any constant barking that defies a purpose was a mystery to me. Your dog has a voice, just like you do, and she uses it just as you do: to communicate something to the people she cares about. I think it’s reassuring that my dog wants to “talk” to me, to the point that I can overlook the deafening qualities of his voice, which, in enclosed spaces, is positively overpowering. It’s the thought that counts, even though I feel better-equipped to stand by this smug belief when my ears are sheltered safely behind industrial-quality ear-plugs. Unfortunately, the language barrier between dogs and humans is solid, which means it’s up to us to use the context, the body language of our dogs, and the circumstances of the vocalization to analyze meaning from a dog barking. Let’s face it, dogs have learned to understand our language far better than we have learned their vocalizations. 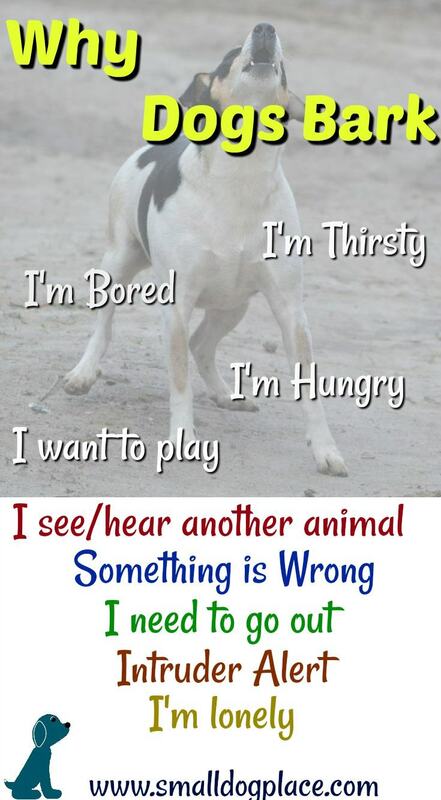 Even if we realize that the dog is trying to communicate, dog barking can be stressful to people. So why do dogs bark? “Why do humans talk?” Let’s start off by saying that dogs bark for many different reasons. A lot of it depends on the breed: some dogs were bred to bark only when a threat is perceived. 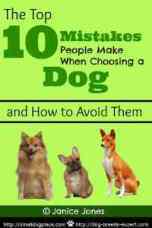 This is true of guarding breeds such as the Rottweiler, the Doberman, and German Shepherds. Others were bred to use their voices as a type of tool, to assist their owners in pursuit of a common goal. A good example of this is the sporting breeds such as Beagles and Bloodhounds who are trained to “Bay” when they pick up the scent of the game. 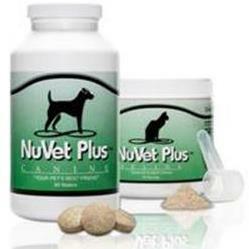 Some small breed dogs are just yappier than others due to years of breeding for this quality. Some dogs, I believe just like to hear their own voice and this is particularly common in some toy breeds. So before we get into how to stop the barking, let’s look at the reasons dogs bark. Its playtime, did you forget? Likely you were aware of this when you adopted your friend and, if total silence was high on your list of priorities, you’d have bought a pet rock, right? You’re lying on the couch reading a book. Your dog awakes from a nap and decides it’s time for a game. She picks up her ball, comes over, and drops it in your lap. You ignore her and keep on reading. After a second of puzzled silence, she nudges your hand with her nose and barks once, loudly. You look over at her and she assumes the ‘play-bow’ position (elbows near the floor, bottom in the air, tail waving) and pants temptingly at you. You return to your book. She barks again, loudly and, when no response is produced, barks again. This time, she keeps it up. After a minute or so of this, sighing, you put down your book, silence is clearly not going to be part of your evening, pick up the ball, and take her outside for a game of fetch. She stops barking immediately. I’m sure you know that respect is a crucial part of your relationship with your dog. You respect her, which you show by taking good care of her even when difficult, feeding her nutritious and tasty food, and showing your affection for her in ways that she understands and enjoys. In order for her to be worthy of your respect, she has to respect you, too. Something that many kind hearted souls struggle to come to terms with is that dog ownership is not about egalitarianism: it’s about you being the boss, and her being the pet. Dogs are not children although it is easy to think about them as such. Rather they are most comfortable and best-behaved when they know that you are in charge. A dog has to respect your leadership to be a happy, well-adjusted, and well-behaved pet. In the situation above, there was no respect being shown by the dog. She was not inviting her owner to play; she was harassing her owner to play. In fact, I would go so far as to call it bullying. Even worse, the behavior was being reinforced by the owner’s surrender to her demands. This little episode taught the dog that to get what she wants, she has to make a noise and keep it up until her desires are achieved. Few people consider dog barking to be a form of bullying towards people! Affection and play-times are obviously necessary aspects of life with a dog, but they have to be on your own terms. If she learns that she can get what she wants by barking, then your house is going to become a noisy place which is unlikely to endear you to your neighbors. To prevent this bullying behavior in your dog from becoming a persistent habit, you have to prove to her that you’re not the kind of person that can be manipulated so easily. The second most common cause of a dog barking is too much ‘alone time’. Dogs are social animals: they need lots of attention, lots of interaction, and lots of communication. Without these things, they become anxious. If you’re at home with your dog, you’re not paying attention to her, and she’s spending a lot of time barking at what appears to be nothing, she’s probably bored and lonely and would benefit from a healthy dose of affection and attention. A solid foundation of dog obedience training will help you prevent or better control common dog behavior problems. Some behaviors require the assistance of a professional, but many are the type that you can fix yourself with a little knowledge. Since I'm a typical "do-it-yourselfer," I enjoy training my dogs at home. How to stop a dog from barking is something that I believe anyone can master. 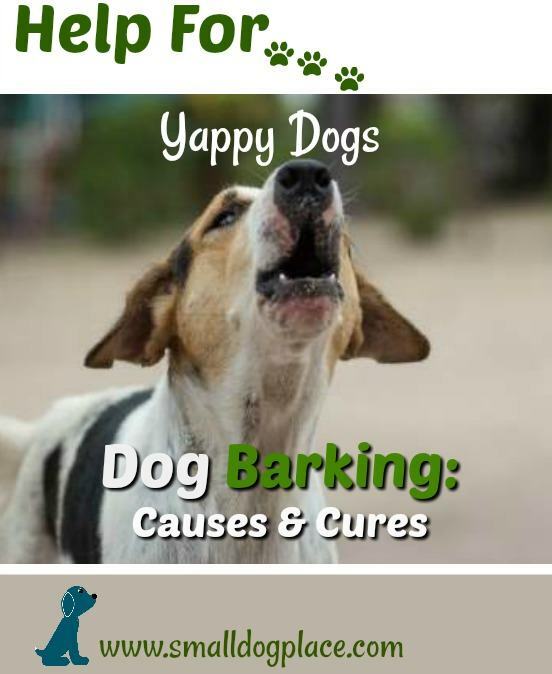 This is one of my favorite resources on dog barking and one that I used when writing this article. I highly recommend it if barking is getting the best of you. If you purchase this directly from my website, I get a small commission from Amazon. Click on the book cover for more information.